Today’s picture from our surveyors files is of condensation black spot mould (also known as Aspergillus Niger). The picture shows black spot mould at the cold spot of the wall / junction as well as mould on the plasterboard finish where the “dabs” holding the plasterboard have created a cold spot. The “dabs” are the only contact between the plasterboard and the cold wall, therefore the temperature of the cold wall is transferred through the “dab” on to the surface of the plasterboard. This causes moisture trapped in the air to “condensate” out at this cold spot. This is otherwise known as “Cold bridging”. 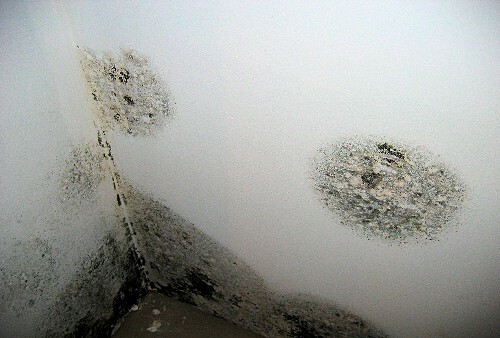 Condensation black spot mould is a direct effect of condensation. Black spot mould usually appears in areas where there is very little air movement such as window reveals, floor / ceiling and floor / wall junctions and behind furniture that is positioned behind colder walls. 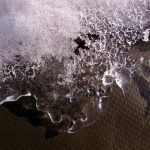 The conditions that black mould needs to develop then are cooler parts of a property where the average relative humidity is 70% or more on a regular basis. There is much concern surrounding the effect of condensation mould spores in the air on the health of you and your children. Generally speaking, mould spores, like pollen, are air-borne and everywhere, and do not affect those in good health. Problems do occur though when mould is allowed to grow and produce spores in great numbers, and these can exacerbate problems in those suffering from asthma, or with respiratory or pulmonary conditions. Condensation mould can be treated very easily. Simply washing off condensation mould and re-painting areas doesn’t work! The only way to remove all the mould spores is to use a condensation mould eradication kit. These mould kits remove mould once and for all! To see how simple the kits are to use check out our condensation mould expert in this video It is though important to reduce the amount of moisture in the air and improve the ventilation in the property (using bathroom and kitchen fans or positive pressure units) or the mould will return!